"Service With A Smile "
My name is Aaron Nelis and I run Bissett Events Wedding DJs. Our aim is that your guests and yourself have the best night of their life. Required by many venues, Bissett Events has not provided satisfactory evidence of having current PLI available. Also required by many venues, Bissett Events has not provided satisfactory evidence of having current PAT records available. A Method Statement, outlining Bissett Events&apos; Health & Safety procedure for setting up disco equipment has not been supplied. Why do people choose to book Bissett Events? "Aaron was absolutely brilliant with the kids. Great music and would definitely book again. " 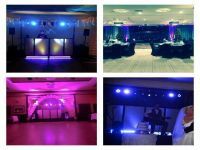 "Glad to hear the Kids had a great time, thanks for booking"
Get FREE no-obligation disco quotes from Bissett Events and other DJs covering your venue. Take 2 minutes to fill in some basic details and we'll do the rest! If you are contacting Bissett Events about an event, it's always a good idea to include the DATE, LOCATION, EVENT TYPE, AGE GROUP and TIMINGS to speed things up!